"I'd put on my money on the sun and solar energy"
"Lets switch to solar- humanity is running out of time"
More than a century after the invention of the bulb, nearly a quarter of humanity still lacks electricity! Nearly 1.6 billion people in the world still do not have access to food, clean water, shelter & electricity. Not even a basic source of regular income. India alone has 400 million people who live without electricity. While the human race advances to innovate and create newer products/services for the Urban Consumer with the least possible negative-impact on our environment, the poorer people are however ignored, and don’t have the basic needs taken care of, and this gap is rapidly widening. This results in a large dependency on relief, funding and grants which only serve as a temporary solutions for these people and their plight still continues, with no sign of sustainable solutions to tackle these problems. Light today, is one of the most vital needs for survival after air, water, food and shelter. Energy contributes to the eradication of poverty by increasing productive hours and reducing dependence on costly kerosene. It improves access to education and income generating activities like handicrafts, pottery, etc. which usually discontinue once it becomes dark, thus, hampering growth opportunities. Portable energy devices increase the safety of women, girls and children walking in dark or remote areas and can reduce rates of violence. 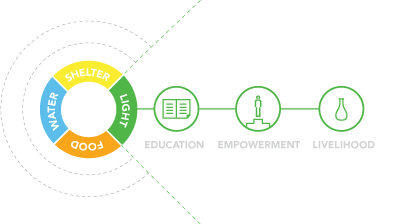 Access to affordable lighting will drastically improve the standards and bring self –reliance, empowerment and livelihood in poor or remote areas of the world.